"A software compressor plugin modeled after high-end gear"
The product presented here is called CompX-Wave. This is an audio plugin for those among you working with a digital audio workstation or DAW to create, record, mix and master audio and music. 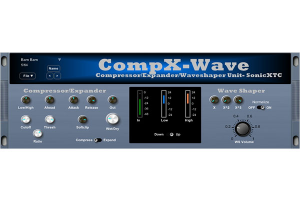 As a matter of fact, CompX-Wave is a power compressor, modeled after expensive boutique compressors. So, here you have something different than your regular master bus compressor, namely a plugin to sculpture your sound, providing extreme sound processing functionality, suited for heavy basses, softened vocals, drums, pianos, synths, and more. The CompX-Wave plugin has been designed to be used on individual tracks but might also bring life to complete mixes as well. Its features include 64 user presets, wavesharper, MIDI automation and compressor annex expander. If interested in evaluating this audio compressor plugin, proceed to the download and load it up in your DAW.